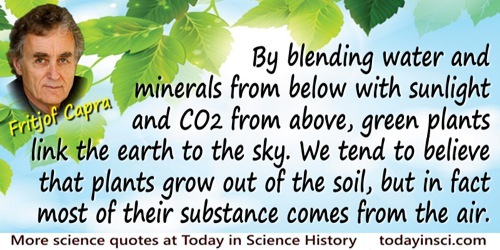 By blending water and minerals from below with sunlight and CO2 from above, green plants link the earth to the sky. We tend to believe that plants grow out of the soil, but in fact most of their substance comes from the air. The bulk of the cellulose and the other organic compounds produced through photosynthesis consists of heavy carbon and oxygen atoms, which plants take directly from the air in the form of CO2. Thus the weight of a wooden log comes almost entirely from the air. When we burn a log in a fireplace, oxygen and carbon combine once more into CO2, and in the light and heat of the fire we recover part of the solar energy that went into making the wood. The Web of Life: A New Scientific Understanding of Living Systems (1997), 178. Every man looks at his wood-pile with a kind of affection. … [T]hey warmed me twice, once while I was splitting them, and again when they were on the fire, so that no fuel could give out more heat. In Walden: or, Life in the Woods (1854, 1899), 263. If a savage will learn how to swim, he can fasten a dozen pounds’ weight to his back, and transport it across a narrow river…. If he will invent an axe … by which to cut down a tree, he can use the tree for a float, and one of its limbs for a paddle, and can thus transport many times the former weight many times the former distance. In 'Report For 1848', Annual Reports on Education (1872), 675.